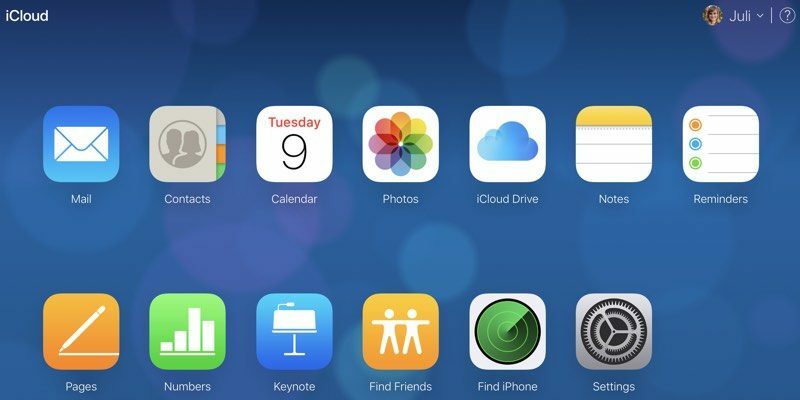 Lost iCloud data isn't a situation that comes up often, but these tools were introduced following an iCloud Drive bug in 2015 that caused some users to lose documents stored in iCloud Drive, prompting the creation of the tool. Visit the iCloud.com website on your web browser of choice. Enter your Apple ID, password, and two-factor authentication code if the feature is enabled. Once logged in, click on the "Settings" app in the main iCloud menu. Scroll down to the bottom of the page until you reach the "Advanced" section. Click on the content that you need to restore. Options include files stored in iCloud Drive, a list of contacts, your Calendars and Reminders, or your Bookmarks. Using the "Restore Files" option on iCloud.com brings up a list of all files that have been deleted over the past 30 days. It includes files from apps that support iCloud Drive, such as Pixelmator, Napkin, and Byword. You can select a single file to restore or multiple files, should there have been a catastrophic event that caused iCloud Drive to be wiped entirely. Check the box to make a selection and click "Restore File." Using the file restoration tool returns the file in question to iCloud Drive in its original parent folder, much like undeleting a photo on iOS. 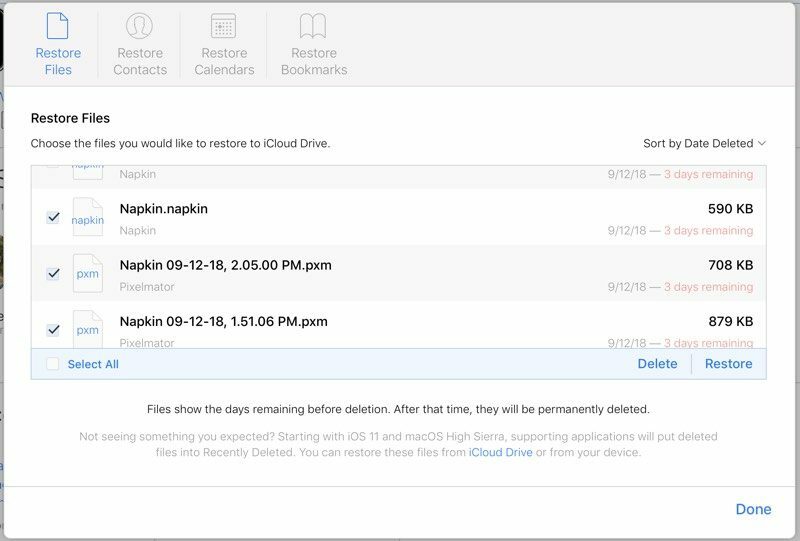 Deleted iCloud Drive files remain available in iCloud for 30 days before being permanently deleted, at which point they become unrecoverable. As a side note, you cannot do a manual permanent deletion with iCloud Drive files as you can do with Photos on iOS - they're sticking around for the full 30 days. Apple regularly archives a list of Contacts, which can be restored to an iOS device at any time. Restoring a list of contacts from the archive will replace the contacts on all iOS devices connected to your iCloud account, while archiving the current list of contacts to ensure nothing is lost. Contacts can't be restored one by one -- this is an all or nothing batch operation. Restoring Calendars and Reminders works like restoring Contacts. Apple frequently creates a backup for the two apps, capturing snapshots for more than a month. Any of these archives can be used to replace a current Calendar or Reminder list, replacing the existing information on all connected iOS devices. 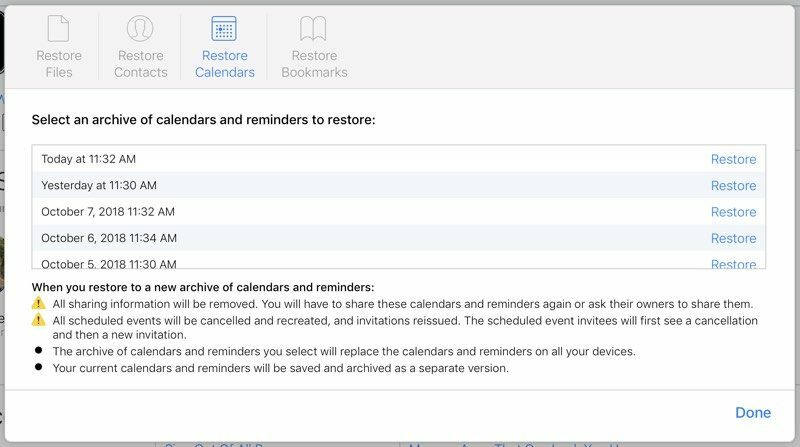 Restoring a Calendar will remove all sharing information, so Calendars and Reminders shared with friends and family will need to be shared again. All scheduled events will also be cancelled and recreated, reissuing all invitations for events. 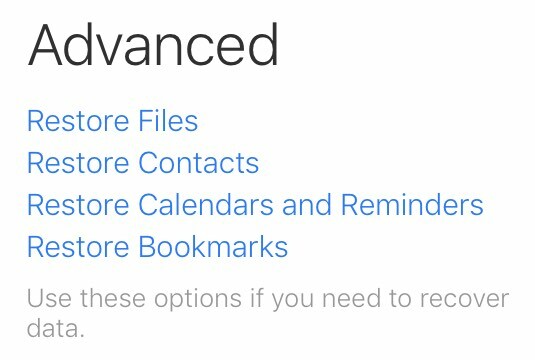 Along with Contacts and Calendars, Apple backs up the bookmarks that you have removed from your Bookmarks list in Safari on a regular basis. 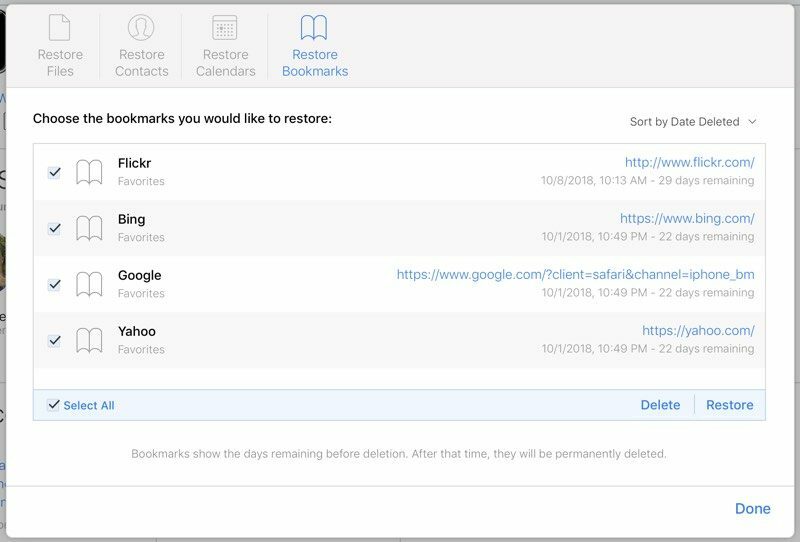 To restore them, simply choose the deleted bookmarks you would like to put back in place and then choose the "Restore" option. Most users probably won't need to delve into the Advanced settings that will restore content like this, but it's nice to have a backup should something disastrous occur. It's also useful because it enables people to restore key information to a new iPhone or iPad without having to work from a full backup. iCloud settings are also handy for immediately signing out of all browsers that are signed into iCloud should you suspect someone has gained unauthorized access to your account and for managing apps that let people look you up using your Apple ID. It also displays all devices you're signed into, offers up a look at available storage, and displays the members of your Family Sharing group. iMessages aren't stored on a server once they've been delivered, so that would be impossible. Call me a cynic but, ‘Apple quietly introduced tools to recover deleted files ('http://goo.gl/6Ttibf') from iCloud’, suggests to me that they are never really deleted. Now if this were google, the Fanboys would be up in arms about how Evil Google are storing your data to monetize it. They just like a same way. Are you sure? I've had past conversations appear on brand new devices after I've set them up and restored with iCloud. You restored a backup which includes Messages. It would be very convenient, but I don't think Apple will ever do it due to privacy concerns. 100% sure, the only way I could think that happened is you were previously signed into iMessage on that device and never signed out, so it thought the messages hadn't been delivered yet. How are messages any more private than, say, emails, calendar data, stuff people keep in iCloud Drive - heck, even photos? My photos are (to me) way more private than simple old text messages. So is my calendar. But Apple already gives us the option to store that stuff in the cloud if we want. I'd like the same option for my messages. Always having access to them would be very much worth it to me.